The Lehigh Valley Zoo recently welcomed another new addition to the family. 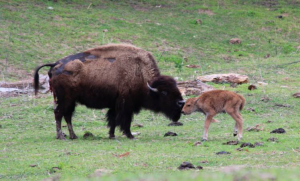 A baby bison (calf) was born on the land surrounding the Zoo—the Trexler Nature Preserve—on the afternoon of May 19th. This joyous event not only intensifies the Zoo’s cuteness factor, but it carries unique significance because, only 10 days prior on May 9th, President Obama signed the National Bison Legacy Act into law. The Act names the American Bison as the national mammal of the United States and places it in the ranks of the Bald Eagle— as a symbol of our country and a major conservation success story. The calf and mom are being monitored by Lehigh Valley Zoo animal care staff as they roam the hillsides of the 1,100-acre Trexler Nature Preserve which surrounds the Zoo property. Lehigh Valley Zoo is contracted by Lehigh County to care for the elk and bison in the Trexler Nature Preserve. Also included in the County’s contract with the Zoo are palomino horses, which reside within the Zoo. Bison calves can weigh up to 40 or 50 pounds at birth and adults can range between 1,000 and 2,000 pounds. In contrast to the dark brown fur of adults, bison calves have reddish fur and can walk and even run within three hours of their birth. The baby and mother can be seen with the herd in the Preserve.